Thank you for choosing Costa Rica as a destination for your next vacation, a country with a great variety of landscapes and microclimates that you can enjoy in the same day, a paradisiacal destination where on the same day you can go from the beaches of the Caribbean to the Pacific in just a few hours. 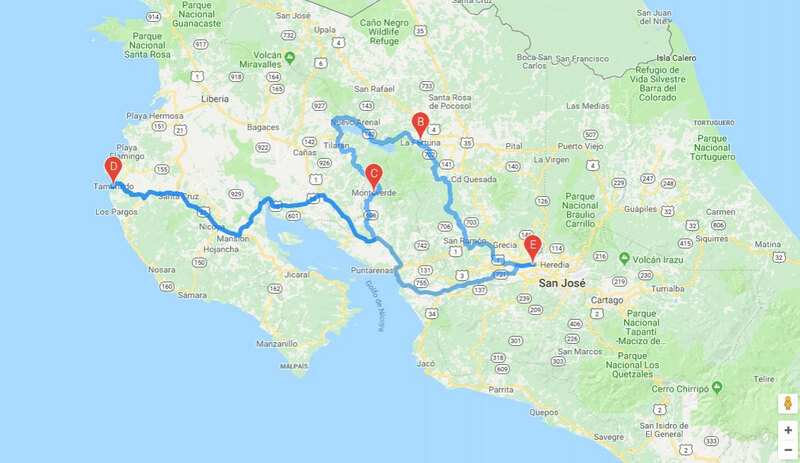 In only 51 thousand square kilometers, the visitor will find: sun and beach, adventure, nature and culture; components necessary to satisfy the taste of thousands of tourists from different countries who find in Costa Rica their ideal vacation spot. In Arenal Evergreen we have designed the following Budget itinerary, sure that you will take memorable memories when you visit these three favorite places: La Fortuna - Arenal Volcano, Monteverde Cloud Forest, and one of the most beautiful beaches in the North Pacific: Tamarindo Beach. 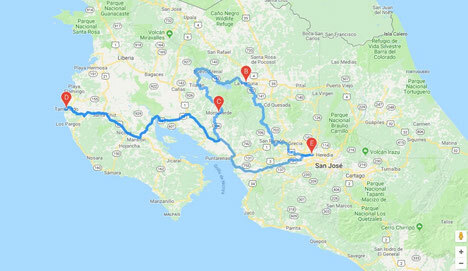 Itinerary Budget Vacations in Costa Rica 9 days 8 days. Day 1: Welcome to Costa Rica and Transportation service to La Fortuna and Arenal Volcano area. Transfer from the Airport to the La Fortuna area. According to the information you provide about your arrival flight, our representative will be waiting for you to provide transportation to your hotel in the Arenal Volcano area. Lodging according to your selection. Day 2: Adventure day, Enjoy a day full of emotions, adventure, nature and lots of fun while enjoying the main activities and attractions. Day 4 Transfer across the Lake Arenal to the Famous Monteverde Cloud Forest. Rest and enjoy the beaches. During the morning enjoy the beach. In the afternoon transfer to Hotel near the airport. Day 9: Good Bye Costa Rica! Transfer to the Airport according to the information provided about your flights. Goodbye, Costa Rica. Until next time. Budget Itinerary 8 nights 9 days. Enjoy a tour of the main tourist places of Costa Rica. The famous Monteverde Cloud Forest. Paradisiacal Beaches of the North Pacific of Costa Rica; Tamarindo Beach. The Capital of San José. According to your flight schedule; the activities of the first and last two days may vary if you wish. Transportation is scheduled in the collective service. If you want private transport we will gladly make the change. If you have a preference for a hotel that is not on the list, tell us and we will gladly make the change. Rates expressed in American Dollars. Rates may vary depending on the date of the trip. Costa Rica Budget Vacation Package.